On a gorgeous summer morning, 117 triathletes lined up to compete in the 10th Annual DinoTri on June 25, 2016 – one of the region’s most beautiful triathlons. 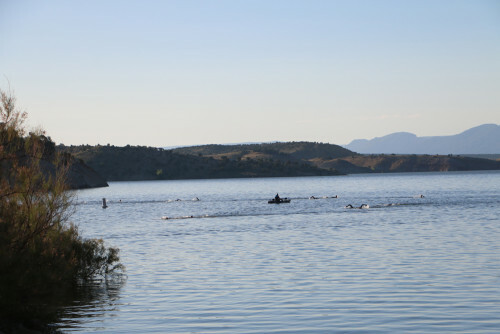 The course featured an open water swim in the Red Fleet Reservoir of .9 miles for Sprint competitors and 1.8 for Olympic racers. This was followed by a 13 or 26 mile bike ride that starts with a tough but scenic climb out of the reservoir – if racers weren’t in too much oxygen debt, they could enjoy stunning scenery – followed by a fast downhill to the finish. The bike leg finished at the Uintah Basin Applied Technical College campus. 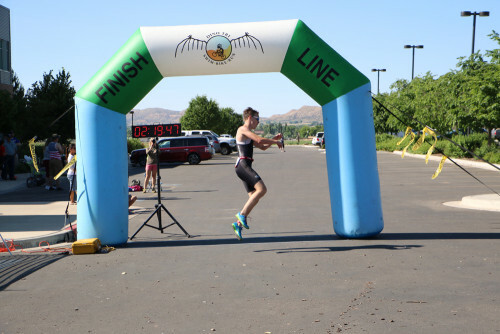 The T2 transition led into the 3.1 or 6.2 mile run through the streets of Vernal, finishing back to the school to cheers, a finish line arch and a photographer to document the racers’ achievements. Finish line refreshments, donuts, and fruit were there for recovery. Christopher White, Sandy, Utah, won the Sprint Men’s 35-39. 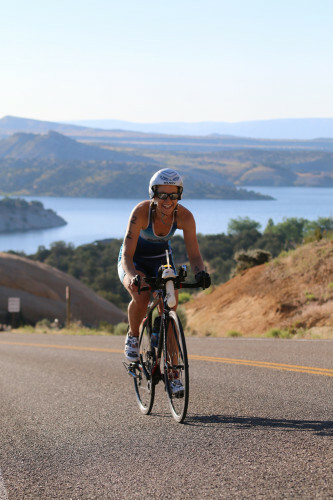 The mountain biker turned triathlete had a little faster race than last year. “I loved it, it was a fun race. I did it last year and came back this year. It was a great course, a fun course. The first two miles are kind of hard, up that steep hill, but the rest of the course is really fun. I was pretty much in my easiest gear going up that hill.” He’s planning on coming back next year. In the men’s Sprint open category, David Warden finished with a time of 1:07:59 and bested Curt Jensen and Jason Holt.